Has your dog had an accident or trauma that is limiting movement or causing pain? Has your dog had recent surgery? Could the function or performance of your dog be improved? Does your dog perform in competitive activities requiring strength and endurance? Have you noticed your dog is sore when you pet or brush him/her? Has your dog developed weakness? Is your dog getting older and has age related changes? If you have answered yes to any of these questions, then your dog would benefit from canine rehabilitation. CanineTech Rehab is a division of BodyTech Physiotherapy. It is a referring practice for veterinary clinics providing physical rehabilitation services for canines offered to you by an animal rehab trained, registered physiotherapist. Dogs suffer from similar injuries as their owners and thus are being offered expert treatment for conditions causing pain and dysfunction. What is Canine Rehabilition? It is physiotherapy assessment and treatment techniques applied to the canine patient. Physiotherapy helps to restore, maintain and maximize strength, function, movement and overall well-being through examination, evaluation, diagnosis and physical intervention. 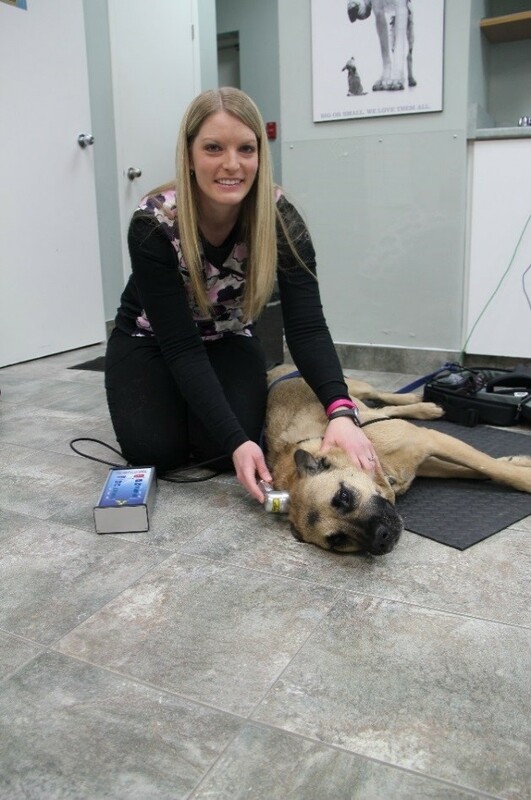 Our animal rehab trained physiotherapist has over 10 years of experience as a human physiotherapist. She has undergone extensive, advanced level post-graduate training to enhance her physiotherapy education, assessment and treatment skills. She has completed the introduction and advanced courses for canine rehabilitation and is working towards her Diploma in Canine Rehabilitation. Canine rehabilitation has been growing in popularity and recognition with a variety of individuals providing these services to the public. The Animal Rehab Dvision (ARD) of the Canadian Physiotherapy Association (CPA) has been advocating for registered physiotherapists to be the professionals of choice to provide animal rehabilitation. Physiotherapists are specifically trained in hands on techniques such as mobilizations that can help to reduce pain and improve mobility. They have in-depth knowledge of how the joints and muscles work, thus being able to prescribe the appropriate exercises and treatment plan. What is manual therapy? It is physiotherapy in which a physiotherapist uses their hands to mobilize (specific technique to improve movement) the joints to reduce stiffness, relieve pain, increase movement and restore function. These techniques also include treating the soft tissue to improve length and strength, as well as a specific exercise program developed for your dog’s individual needs. Manual therapy is important post-surgical, post-fracture, post-immobilization or for arthritic joints, allowing the dog to regain pre-injury mobility and function. At CanineTech Rehab our approach to canine rehab follows the same principles we apply to human physiotherapy at BodyTech Physiotherapy. The assessment of your dog will focus on identifying the underlying cause and contributing factors to their injury or condition. This approach will enable us to treat your dog in the most effective way. Appropriate exercises, manual therapy and modalities will be combined to improve the course of your dog’s recovery. Ongoing communication and cooperation with you and your veterinarian will ensure the best care possible. Our mission at CanineTech Rehab is to improve the quality of rehabilitative care for our human companions, our dogs. We provide high quality, advanced manual therapy care for your dog using the knowledge and skills of a certified Canine Rehab therapist. This entry was posted in Canine Rehabilitation and tagged Dog, rehabilitation on March 9, 2015 by bodytechphysio.